The Evening Primrose Concentrate is an all-natural, multi-tasking treatment to tackle signs of premature ageing, developed by holistic cosmetic brand Weleda. As we age, skin begins to lose elasticity and collagen production slows down, resulting in skin appearing dull and saggy. 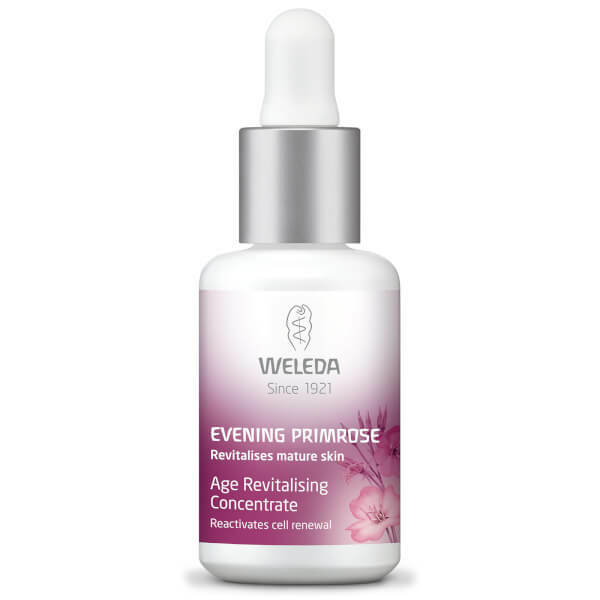 This advanced serum is powered by Golden Evening Primrose; a highly active extract that helps stimulate skin’s natural protective and regenerative abilities, as well as extracts of Aloe Vera and Centella Asiatica. Combined, the lightweight formula creates a visible plumping and firming effect, smoothing the look of fine lines and wrinkles. The complexion is left feeling revitalised and replenished, without the need for harsh chemicals or abrasive treatments. Free from parabens, sulphates, petrochemicals, silicones, synthetic dyes and artificial fragrances. Water (Aqua), Alcohol, Glycerin, Aloe Barbadensis Leaf Juice, Olea Europaea (Olive) Oil Unsaponifiables, Hamamelis virginiana (Witch Hazel) Distillate, Oenothera Biennis (Evening Primrose) Oil, Plukenetia Volubilis Seed Oil, Centella Asiatica Flower/Leaf/Stem Extract, Althaea Officinalis Root Extract, Carrageenan, Xanthan Gum, Arginine, Fragrance (Parfum)*, Limonene*, linalool*, Benzyl Benzoate*, Benzyl Salicylate*, Geraniol*, Citral*, Farnesol*. *from natural essential oils.